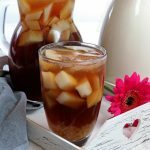 Try this Sago’t Gulaman drink. 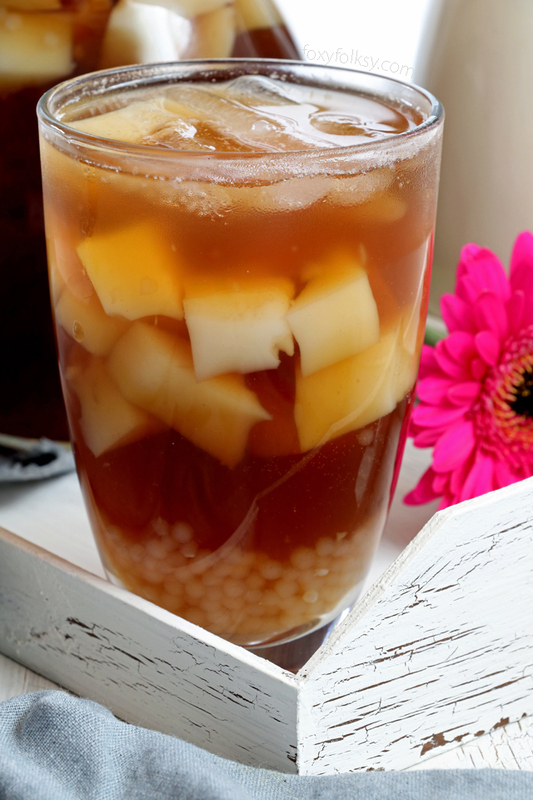 A Filipino sweet refreshment made from brown sugar syrup with tapioca pearls and almond jelly. This post is actually a bit overdue because I made this sago’t gulaman the same time I made Taho. Well, simply because I have some brown sugar syrup and cooked tapioca pearls left from my homemade taho. I only had to make the almond jelly or gulaman in this case. ‘Sago’ is what we call the tapioca pearls in Filipino and ‘gulaman’ generally refers to gelatin. Aside from the three main ingredients already mentioned, there is a secret ingredient I learned from my Mama. You see, sago’t gulaman was one of the main beverages offered when my parents still had the canteen. We also have buko (coconut juice) and melon (seasonal). It is really not so much of a secret because I am sure most (if not all) ‘samalamig’ (refreshment) vendors know about it. It is the banana essence. It gives this drink an added aroma and flavor. 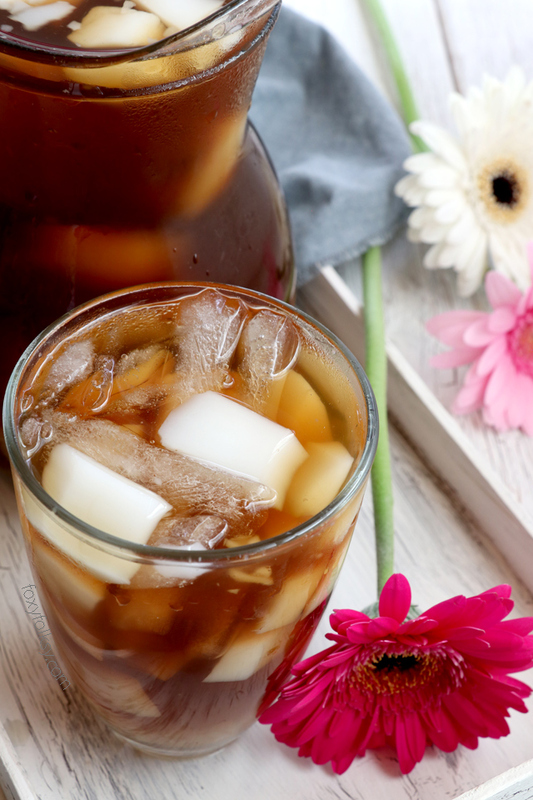 Try this Sago't Gulaman drink. 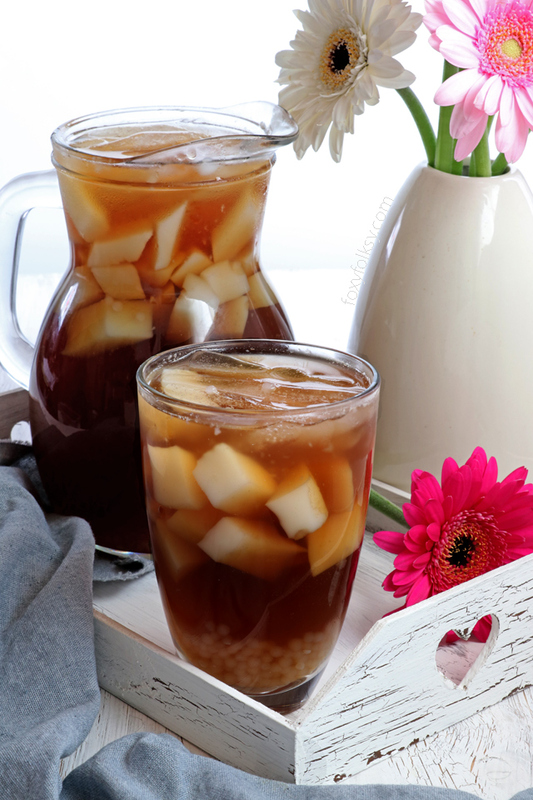 A Filipino sweet beverage made from brown sugar syrup with tapioca pearls and almond jelly. Make the Gulaman or almond jelly. Read and follow the package instructions for cooking the gelatin powder. But use only 1 1/4 cups of water plus 1/4 cup milk, 2 tablespoon sugar and 3 drops of almond extract. Chill until the gulaman firmly sets. Cut into squares or small diagonal shapes. Cook tapioca pearls. Boil a half liter of water and add the tapioca pearls. Let it cook for 10 minutes. Place a colander/strainer in a bowl or pot and pour the contents to separate the tapioca from the water. Use the same water and bring it to boil the second time. Wash the strained tapioca pearls thoroughly with tap water and put it back into the boiling water and cook again until they become completely translucent and no more white spot at the core. Make the Arnibal or brown sugar syrup. In a pot over medium heat, bring 1 cup of brown sugar and 1 cup water to boil and cook until all granules are dissolved and become thick like syrup (about 7-10 mins). Remove from heat and let it cool down. Fill a big pitcher or jug with 4 cups of cold water. Stir in half of the syrup, adding more depending on the preferred sweetness. Add some drops of the banana essence (about 3-5 drops). Add the tapioca pearls and gulaman. Add some ice cubes. Hi Rizza, just skip it. It will taste totally different. I’ve been thinking about this the other day and watermelon popsicles for the kids. Hanoi summer is more unforgiving than Manila heat. Nice to hear from you again Zara! It’s not summer in Germany yet, but watermelon popsicles sound great! ??? ?